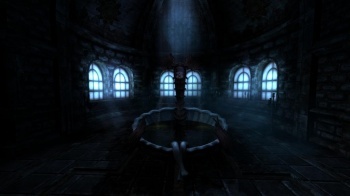 Frictional Games' Amnesia: The Dark Descent has sold a horrifyingly large number of copies. Swedish developer Frictional Games might be entering the best year of its life. Its latest title, Amnesia: The Dark Descent, has sold more than double what it dreamed it'd sell, making the company yet another beneficiary of digital distribution and strong word of mouth. A week after release, Frictional Games called Amnesia a "make or break game." Sales were initially good, and a month later Frictional announced it had beaten its goal of 24,000 copies sold with sales of 36,000, allowing it to stay in business to keep on trucking. The credits do not roll there, however. Today, four months after Amnesia's release, the horror game has sold more than 200,000 copies. Frictional's success with Amnesia is an example of how the expansion of digital distribution is able to keep more types of studios in business than ever before. When brick-and-mortar sales were the only way for a developer to earn its keep, first week or month sales were staunchly relied upon. Now, a game can be released on a platform like Steam to "fair" initial sales, but those sales might later grow into an inferno with good PR and the benefit of consistent availability at the click of a mouse. This is apparently exactly what happened with Amnesia. The incredibly scary game got a continued smattering of free, positive press, and combined with a recent Steam sale ended up moving more copies than Frictional had ever dreamed. Heck, even I bought Amnesia on word of mouth, and I'll probably be too afraid to ever load it up. Frictional's dream was 100,000 sold, and the game has already doubled that. Many of those copies were sold at as much as 75% off the regular price of $19.99, but 50,000 in sales at $7 generates more revenue than 10,000 sales at $20, so Frictional isn't complaining. The studio says it's now financially stable and has enough operating funds to fully complete its next game without worry. For that next game, Frictional says it wants to take "experience based gameplay" to the next level, but in a different direction that should have "delightfully disturbing results." It'll likely be another game that I won't have enough guts to play, but that doesn't mean I won't buy it anyway if it gets enough buzz.